ST. LOUIS - If there is one place that kids don't want to be, it's this place. The hospital. St. Louis Children's is one of the best in the country but 9 year old Isiah Harris has had to practically grow up here. Isaiah was born with Eagle-Barrett syndrome, a rare disorder that caused his kidneys to fail. He comes to the dialysis center, three days a week, four hours a day. "Basically, dialysis filters and cleans his blood for him because his kidneys do not work, "explains his nurse Ashley Jarden. When a child has to spend so much time here, hospital walls can seem very high. But now, theyre coming down thanks to the man known as "Dr. Robot". "I happen to live in an apartment near here and I'd walk by the Children's hospital and it occured to me having kids do virtual visits. it would be great fun for them, "Dr. Keith Miller told us. Dr. Miller is a professor at the University of Missouri St. Louis. It's his mission to get kids interested in Science, Technology, Engineering and Math and he says one way to do that is with something called the VGo robot. 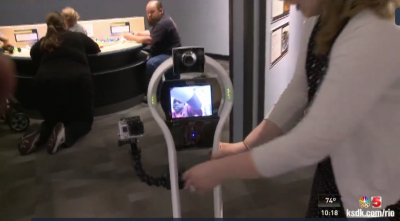 "And it's job, "explains Miller, "is to allow people to have a laptop and have the robot visit some place and they virtually visit through the laptop through the internet to the VGo." In other words, Isaiah can leave the hospital without ever getting up. With help from Cate Edwards of the St. Louis Science Center, Isaiah went on a field trip. He controls the robot, giving him virtual freedom. "The VGO robot is like a bridge, explains Christian Greer, the Chief Education Officer at the Science Center. "It gives them an opportunity to be able to connect with us and to tour around just like everyone else." And whether it's getting to see bugs or dinosaurs or liquid nitrogen, like all young boys, Isaiah has a developed a sixth sense. A sense of wonder. "They put a balloon in it and it started melting!" exclaimed Isaiah. Dialysis keeps Isaiah alive but it's an experience like this that keeps up his spirit. A virtual escape from a difficult reality thanks to a generous dose of technology.